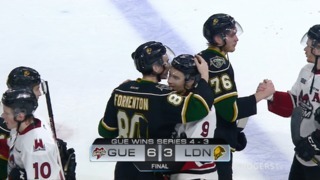 Liam Foudy scored twice and added an assist as the London Knights doubled up the Spitfires 4-2 in Windsor on Sunday afternoon. 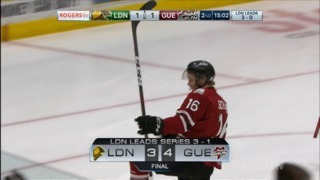 The victory was London’s 12th in a row and took their record to 14-0-1 in their past 15 games. Still, the streak that continues to grow is not exactly a major topic in the dressing room. London has held the lead in games quite often lately, but against Windsor they fell behind 2-0 through 20 minutes and had to find a way back. Knights assistant coach Rick Steadman complimented the London players for the way they stayed calm. “You just have to try to get a couple of shots on net and hope for the best and if things start to happen for you, then you try to build on them,” Steadman said after the game. A goal in the first minute of the second period by Liam Foudy allowed the Knights to get going. It was set up by Paul Cotter, who was playing just his fifth game in the OHL. He pointed to the game plan. The Spitfires were playing their third game in three days and London seemed to pull away in the third period, as they outshot the Spitfires 10-4 and broke a 2-2 tie with a power play goal by Conner McMichael. Joseph Raaymakers made 28 saves for the Knights and picked up the win. With the net empty late in the game, he seemed to try to lift the puck down the ice, only to have it knocked down before it left the Knights zone. London now has a three-point lead over the Soo Greyhounds for first place in the Western Conference standings with two games in hand. They are six points behind Ottawa for first place overall. The 67s are 17-0-3-1 in their past 21 games. When the Knights played in Windsor on October 4, Curtis Douglas scored the first goal of the game when he stripped a puck away behind the London net and wrapped it around and in. 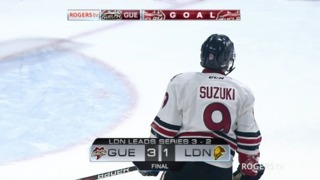 On Sunday, the 6’9″ Douglas swooped in, took a puck away and swung it in front of the London net where it hit a Knight skate and slid past Joseph Raaymakers for a 1-0 Windsor lead. Daniel D’Amico buried a rebound on a Cole Purboo shot on goal, two seconds after the end of a Spitfires power play to give Windsor a two-goal bulge through 20 minutes. The Knights fought back in the second period as Paul Cotter set up Liam Foudy for his 11th goal of the year, just 51 seconds after the opening faceoff to get London on the scoreboard. A turnover deep in Windsor territory gave Matvey Guskov a clear shot at the net and he beat Michael DiPietro to tie the game 2-2 at 11:23. The game stayed tied until a late power play, when Connor McMichael deflected an Evan Bouchard shot into the top corner of the Spitfires net to put the Knights ahead 3-2 with 4:09 remaining. Liam Foudy and Alex Formenton played give and go on a two-man breakaway from just inside the Windsor blue line. Foudy finished the play for his second goal of the game and that completed the scoring. London has given up just 58 goals this year, or 2.5 per game. Only Oshawa and the league-leading Ottawa 67s are even close. They are the only other teams averaging less than three goals against per game. The Knights are averaging 4.16 goals for per game, which is No. 1 in the OHL and better than Ottawa, Sault Ste. Marie, Barrie and Sarnia — the other four teams that have cracked the century mark in scoring. In their last seven games, the Knights have had 34 goals. Break it down, and you feel the heat. The annual Teddy Bear Toss will take place on Sunday, Dec. 2 at Budweiser Gardens, when London and Sarnia go head-to-head for the third time this season. The Knights still hold the Ontario Hockey League record for the number of bears and stuffed toys thrown onto the ice. They collected 10,671 plush toys for the Salvation Army’s Christmas Hamper program in 2012. The world record belongs to the Calgary Hitmen, whose fans rained down 28,815 stuffed toys in December 2015. The first Teddy Bear Toss was held by the Kamloops Blazers in December 1993. Shane Doan and Darcy Tucker combined to set up Brad Lukowich for the first official goal to bring down the bears. It has since become an annual tradition in just about every junior hockey rink. The Hershey Bears have also held one, and internationally, they have been done in Sweden and Australia. The Knights have been holding their Teddy Bear Toss since 2001. Patrick Barbieri scored the first Teddy Bear Toss goal for the Knights. London will spend the week practicing and then play home games on Friday night and Sunday afternoon. The Erie Otters will visit Budweiser Gardens on Friday, Nov. 30. The teams met on Nov. 18 in Erie, where the Knights won 6-3. 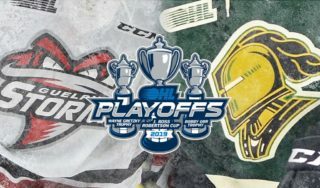 Erie is battling with Sarnia and Kitchener to get into a playoff spot in the Western Conference. On Sunday, Dec. 2, London will host the Sarnia Sting for their annual Teddy Bear toss. The Knights have won both games against the Sting this year, beating them 7-6 in overtime on a goal by Liam Foudy and 4-2 in Sarnia in late October.